In the modern era we see economic collapse, climate change, and energy crises. These less frequently seen as acts of God, but are depicted as the inevitable failure of our human consciousness to conceive alternatives, a failure of the imagination on an enormous scale. 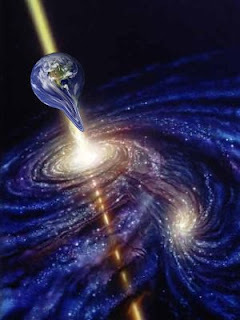 We are depicted as on a collision course with our demise because of our unlimited greed and unrestrained growth. Thus, in a LINEAR description of history, the only result of a genesis is an apocalypse when all that has been created has been used up. The word for Apocalypse in German is Gotterdammerung. Mircea Eliade sees that what marked the pivotal break of Hebrew religion from Hellenistic and ancient pagan ideas of cosmology, was its rejection of the narrative of eternal return. Before that, all life could be framed around the promise of regenesis, as seen in the idea of the Egyptian solar year or the Near Asian (Egyptian and Babylonian) creation myths. Once this break occurred, it brought about the idea that violence, suffering and ecological disorder were no longer arbitrary, no longer part of an endlessly repeated process, but were a punishment. Dangerous climate changes—such as those seen in Biblical plagues, or even the Great Depression were a direct result of “sins” committed against either God, or the earth, or both. Even world wars and bloody injustices and catastrophic events were Gotterdammerung, revealing the Apocalypse as the logical conclusion to Genesis. Because this consciousness is so ingrained in the human psyche now as a result of Biblical proselytizing, it has been categorized as inevitable. And if the end of the world is nigh and its destruction inevitable, then why bother with its trash and depletion and pollution anyway? This world view is actually not one that believes in salvation; its faith rests in damnation alone. The only shred of faith is in an individual egoic consciousness that might survive by crossing oneself like a “dotted I and a crossed t” just before the big one blows its last gasket. Then I will be saved, but the rest of the world is going to hell in a handbasket. Please, please, tell me you are not one of those people. If you do believe in faith, love and personal responsibility, if you can handle the idea of the cyclical nature of reality and the Eternal Return, then work with me now to envision some renewed life beyond December 21, 2012 that will include a commitment to the environment, to others on this planet, to the children of the generations who will follow after. The ancient Egyptians believed in a concept called Zep Tepi, or “The First Time” and it happened over and over again, when the Nile flooded every year to replenish the valley, to prepare it for new growth, and to give sustenance to its people. If there is a community garden in your area, I invite you to join them. If there is an environmental preservation organization in your area, please support them. And check out the website for Interfaith Power and Light. Whatever you do, become a co-creator of your life with the divinity of your choice. I dance in many worlds. I lead trips to Egypt. I teach classes on writing. I run a writing and spiritual retreat center. I follow my heart throughout my studies. But, as Gloria Steinem has said, writing is the only thing that when I do it, I don't feel I should be doing something else.